Danny O'Brien is treating the upset win of Shopaholic over odds-on favourite Mosheen last week as a bonus on her path to Saturday's Group 2 Angus Armanasco Stakes at Caulfield. The Pins filly made it three wins from five starts for O'Brien since she was transferred from a New Zealand stable with her victory in the Group 3 The Vanity (1410m) at Flemington over last spring's nine-length Victoria Oaks winner. Shopaholic is raced by Garry Chittick, the owner of Waikato Stud in New Zealand, and is the first foal of the O'Reilly mare Splashing Out who was prepared by O'Brien to win four races including the 2006 Group 3 Thoroughbred Club Stakes (1400m) at Caulfield. She chased home Gold Edition in the 2006 Group One Ascot Vale Stakes (1200m) at Flemington. "The plan was always to run her (Shopaholic) last Saturday to probably have her at her best for this Saturday and obviously winning was a bonus," O'Brien said. "She's come out of the run really well and I'm sure she'll improve again this Saturday. "There are a couple of pretty smart fillies waiting there, Soft Sand and the New Zealand filly (Anabandana) and she (Shopaholic) gets a penalty now. It's a bit easier to do it when you are on the limit but now she's got 57kg. "She's come through it super, she's drawn well (in barrier four) and she's going to get a good run. "She doesn't know how to run a bad race. She's a really tough little filly and if anything the run has brought her on more." Glen Boss takes over the reins from Dwayne Dunn on Saturday, while Damien Oliver replaces Craig Williams on So You Think's half-brother Now You Know in the Group 2 Autumn Classic (1800m). "He's a colt I've always had a lot of time for and he's going to get better as he steps up in distance," O'Brien said of the son of Elusive City. 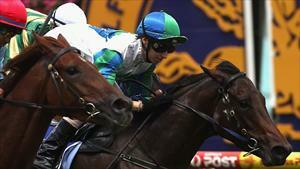 "We're really hopeful he can go all the way to the AJC (Australian) Derby. He needs to do everything right because it's a big step up in class for him on Saturday. "The distance will certainly suit him. It will be a really good test fot him but as long as he runs a very good race for us we'll keep heading that way. "The Alister Clark is in three weeks and then we've got the Rosehill Guineas and then the Derby."